Objectives: The chordae tendinae (CT) are strong, fibrous connections between the valve leaflets and the papillary muscles. Dysfunction of the papillary muscles and chordae is frequent. Mitral valve replacement with preservation of CT and papillary muscles may preserve postoperative left ventricular function better than conventional mitral valve replacement in patients with chronic mitral regurgitation. Methods: The study was carried out on 116 human cadaveric hearts. The heart was opened through the atrioventricular valve to view the constituents of the complex. Origin, attachments, insertions, distribution, branching pattern and gross structure of CT were observed and studied in detail. Results: In the present study more than 21 terminologies of CT were defined by classifying it into six different types. Classification is done according to the origin, attachments, insertion, distribution, branching pattern and gross structure. Terminologies defined are as follows. Apical pillar chordae, Basal pillar chordae, True chordae, False chordae, Interpillar chordae, Pillar wall chordae, Cusp chordae, Cleft chordae, Commissural chordae, First order chordae, Second order chordae, Free zone chordae, Marginal chordae, Rough zone chordae, Straight chordae, Branched-fan shaped chordae, Spiral chordae, Irregular-web chordae, Tendinous chordae, Muscular chordae, Membranous chordae. 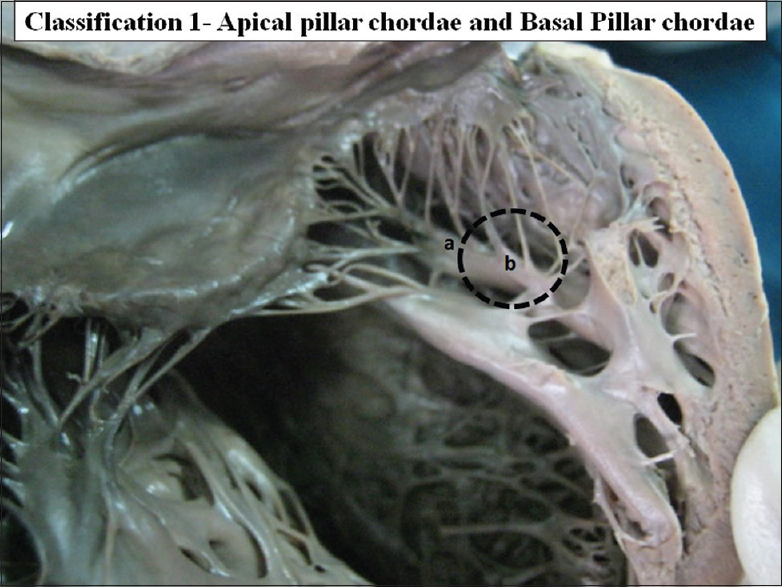 Basal pillar chordae are found in 9.48%. Mean number of chordae taking origin from apical half of a single papillary muscle or single head of papillary muscle was 9.09 with the range of 3-18. Mean number of the marginal chordae attached to a single cusp was 22.63 ranging from 11 to 35. Strut chordae showed interesting insertion with broad aponeurosis in 38.79% and large muscular flaps in 13.79%. 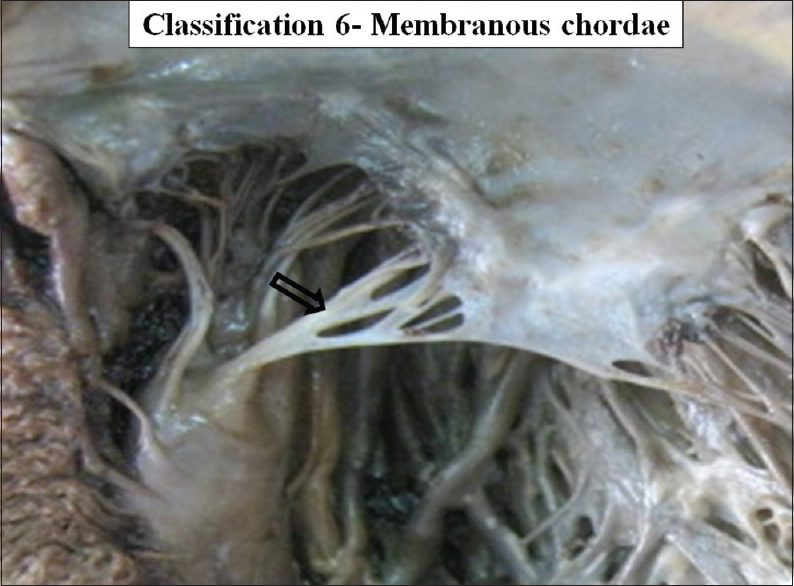 Chordae muscularis were found in 14% and membranous chordae were found in 6%. Conclusions: This knowledge may prove useful for cardiologists and cardiac surgeons. The chordae tendinae (CT) are strong, fibrous connections between the valve leaflets and the papillary muscles. These are attached to the leaflets on to the ventricular side and prevent the cusps from swinging back into the atrial cavity during systole. The CT is the important component of atrioventricular (AV) valve complex. Understanding functional anatomy of the mitral valve is dependent on understanding the relationship between CT and the cusps-pillars. Chordae are classified according to the role they play in ventricular dynamics. Commissural chordae plays an important role in approximation of the two adjacent cusps in ventricular contraction. 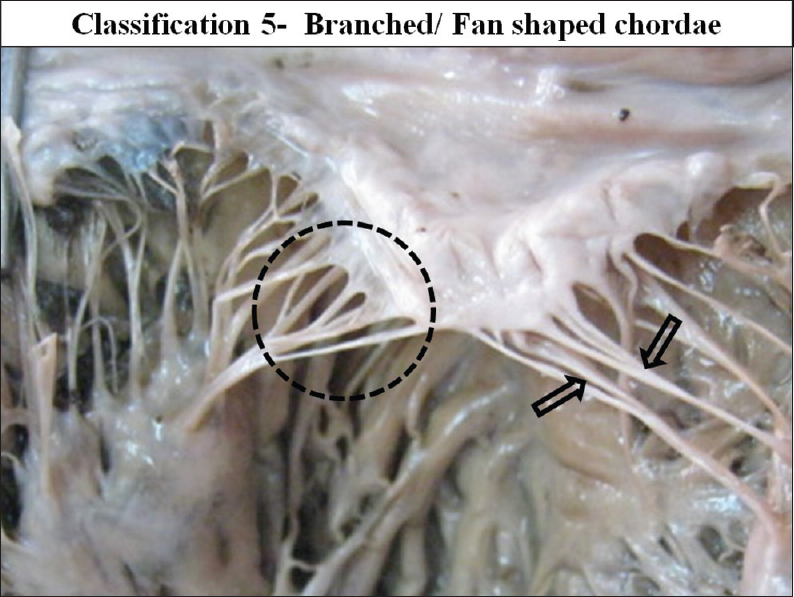 Commissural chordae are branched fan shaped, or they may be dichotomous. If the chordae inserts to the adjacent cusps of different height there are chances of improper approximation of the cusps creating mitral valve regurgitation. However, the height of the two adjacent cusps is casually, often different with proper valve functioning. In such cases, there are some factors helping in the mitral valve functioning. (1) Chordal length of the short cusp remains short with a strong pull. (2) Chordae occupies a large marginal area onto the short cusp than that of the heighted cusp. (3) Second order chordae helps in approximation. (4) Position and the direction of the pull of the papillary muscle. If one of the factors goes wrong or become weak, it shows improper function. The false CT, the interpillar chordae keeps the two pillars closer. Or they keep the different heads of a single papillary muscle closer. Pillar wall chordae pulls the pillar and ventricular wall closer. Thus, the false chordae in short helps in the ventricular contraction. Straight chordae attached to the commissural area of the cusp is nearly functionless. Hence this is a rare combination. Usually the commissural chordae are branched fan-shaped or dichotomous. Straight chordae are usually the second order rough zone chordae. These chordae shows oblique pull of arrangement with the pillar and also to the cusp. If these chordae are strong with the strong pull of the pillar from its tip may show adverse effect on the valve function. Irregular-web forming chordae can alter the direction of pull of the cusps but mostly these are helpful in the approximation of the cusps. If the irregular web is present in the chordae attached to a single cusp, act adversely. 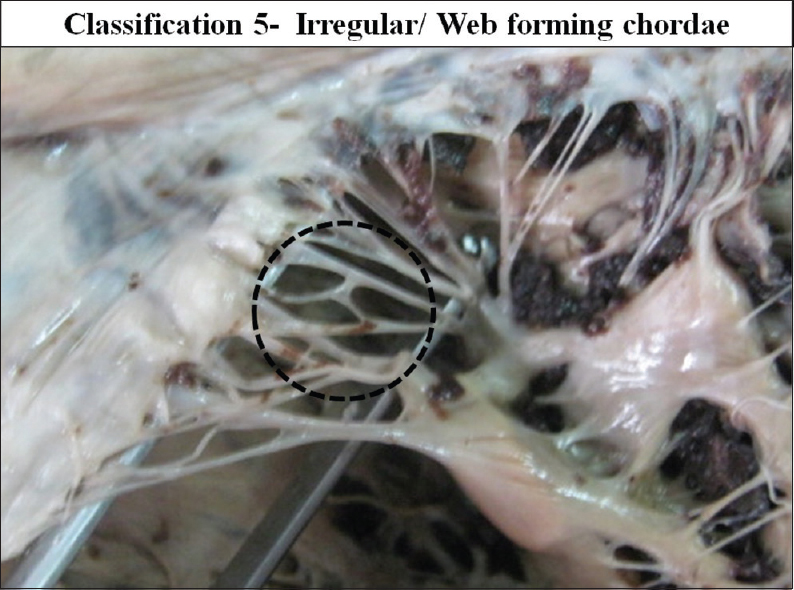 Irregular-web forming chordae are formed probably due to the improper absorption of the myocardial tissue. We studied the morphological aspects of mitral valve leaflets and the papillary muscles. In these studies, we made distinct and interesting observations regarding the number of leaflets and the papillary muscles. , The chordae that hold this two dynamic structures together and help them accomplish their function warranted individual attention, in order to study them in greater detail. The study was thus planned to put CT under extended scrutiny. A number of studies on the CT are found in the literature. There are very few studies covering each and every aspect of CT and its morphological features in its entirety. To make satisfactory correlative clinicopathologic studies, a workable classification of CT is needed. No such classification is available. This research work proposes such a classification, based on a detailed study of the CT of normal mitral valves. The study was done in the department of Anatomy, Rural Medical College, Pravara Institute of Medical Sciences, Loni, India. The study started after ethical clearance by the Institutional Ethical Committee. A total of 116 formalin-preserved hearts of human cadavers were used in the study. The cadavers from whom the hearts were removed were persons of unknown age and unknown cause of death. The approximate age of these individuals at the time of death must be in a 40-70 year the range. Hearts with gross morphological variations were excluded from the study. Hearts were washed, and the cavity of the left ventricle was opened by taking a longitudinal incision along the left border, extending from the left auricle to the apex of the heart. Blood clots were removed carefully to preserve the chordal attachment. The CT were dissected and studied in detail. Origin, insertions, distribution, branching patterns and gross texture of CT were observed and noted. In the present study, 21 terminologies of CT were defined by classifying it into six different types. Classification is done according to the origin, attachments, insertion, distribution, branching pattern and gross structure. Terminologies defined are as follows. (1) Apical pillar chordae, (2) Basal pillar chordae, (3) True chordae, (4) False chordae, (5) Interpillar chordae, (6) Pillar wall chordae, (7) Cusp chordae, (8) Cleft chordae, (9) Commissural chordae, (10) First order chordae, (11) Second order chordae, (12) Free zone chordae, (13) Marginal chordae, (14) Rough zone chordae, (15) Straight (un-branched) chordae, (16) Branched-fan shaped chordae, (17) Dichotomus-spiral chordae, (18) Irregular-web forming chordae, (19) Tendnous chordae, (20) Muscular chordae, (21) Membranous chordae. Classification VI - According to the gross structure of chordae (tendinous, muscular and membranous chordae). Apical pillar chordae and Basal pillar chordae are as per the origin, True chordae, and False chordae as per the attachments. False chordae were further divided into the Interpillar chordae and pillar wall chordae. True chordae were divided as Cusp chordae, Cleft chordae and Commissural chordae. As per the attachment on the cusp portion, they are designated as first order chordae (freezone and marginal chordae) and second order chordae (Rough zone chordae, Strut chordae). According to the branching pattern of chordae they are defined as straight chordae (un-branched chordae), branched chordae (fan shaped chordae), dichotomus (spiral chordae), irregular (web forming chordae). Tendinous, muscular and membranous chordae are the types as per the gross structure of the chordae. 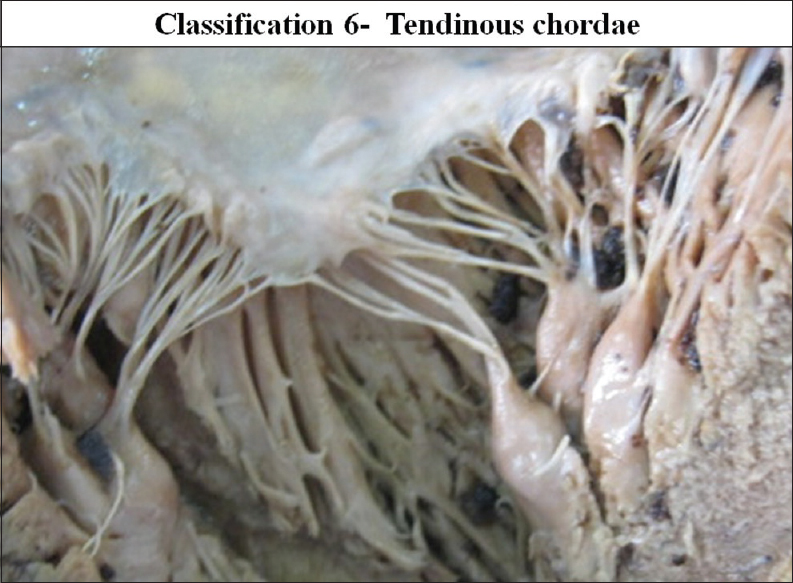 Chordae tendinae take origin from the papillary muscles. In all 116 cases CT took origin from the upper-half of the papillary muscle. These are called as apical pillar chordae. 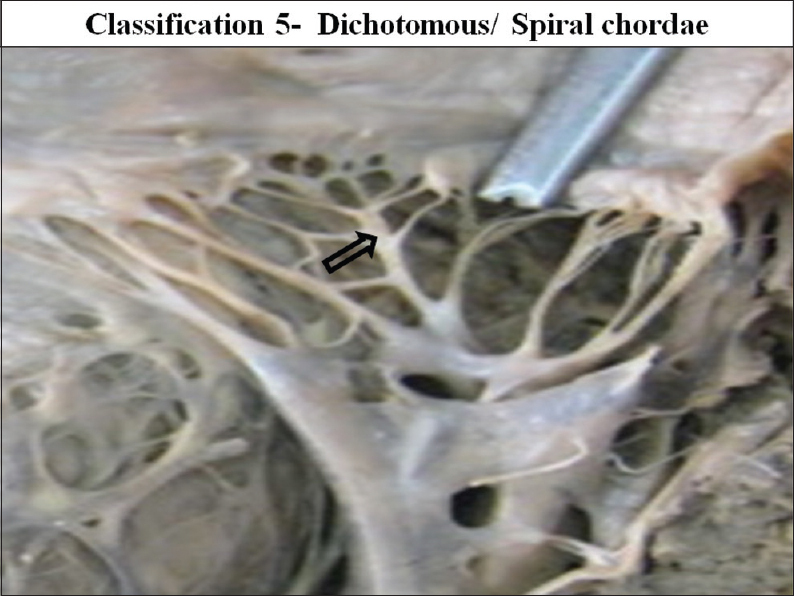 In 11 cases (9.48%) the chordae also arose from basal ⅓ of the papillary muscles. These are called as the Basal pillar chordae [Figure 2]. The mean number of the CT taking origin from apical half of papillary muscles was 9.09 with the range of 3-18. The mean number of basal pillar chordae was 3.33 with the range of 2-5 [Table 1]. Chordae takes origin from the papillary muscle and inserts into the cusp. These chordae are called as True chordae. True chordae are the connections between the cusps and the papillary muscles. These are the Cusp-pillar chordae. In some cases instead of the cusps, other end of chordae was found to be attached with the other papillary muscle or to the ventricular wall. These chordae are called as false chordae. According to the attachments false chordae were further divided into the interpillar chordae and the Pillar wall chordae. False chordae were present in 65 cases (56.03%). 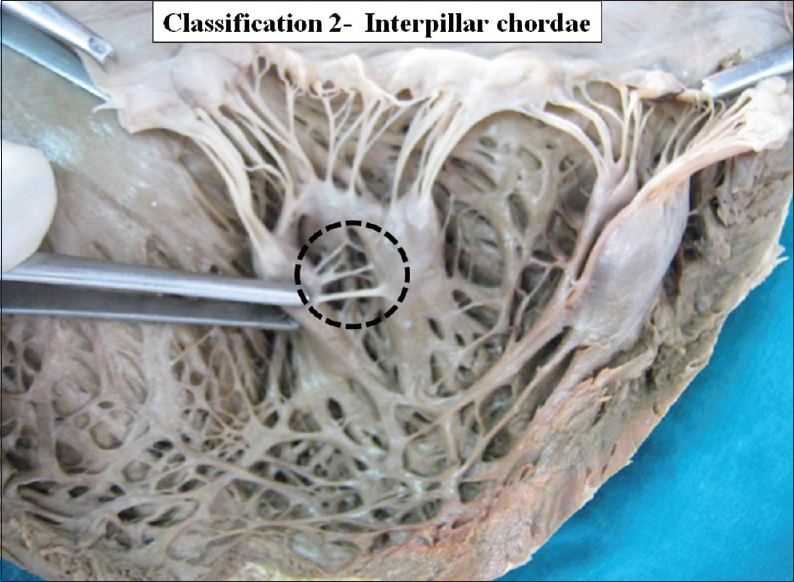 Interpillar chordae were present in 58 cases (50%) [Figure 3]. Schematic diagram of interpillar chordae is shown in [Figure 4]. 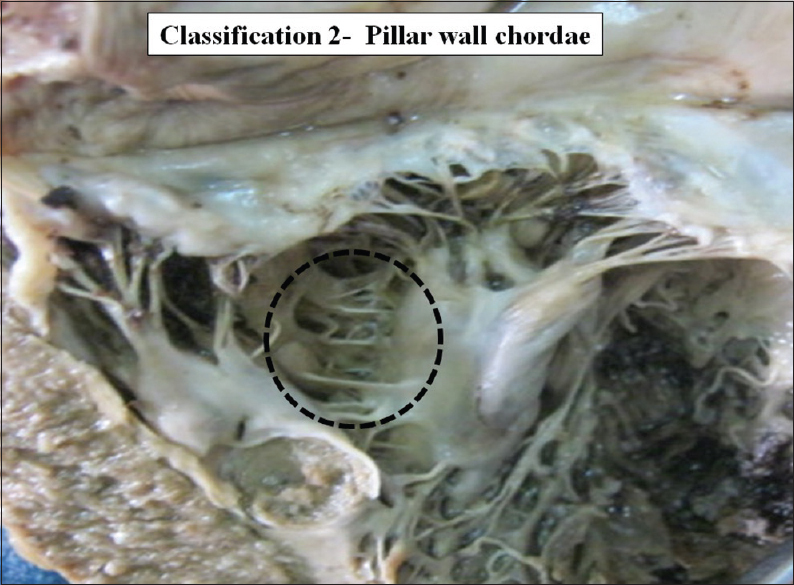 Pillar wall chordae were present in 7 cases (6.03%) [Figure 5]. Schematic diagram of pillar-wall chordae is shown in [Figure 6]. True chordae is the cusp pillar chordae. 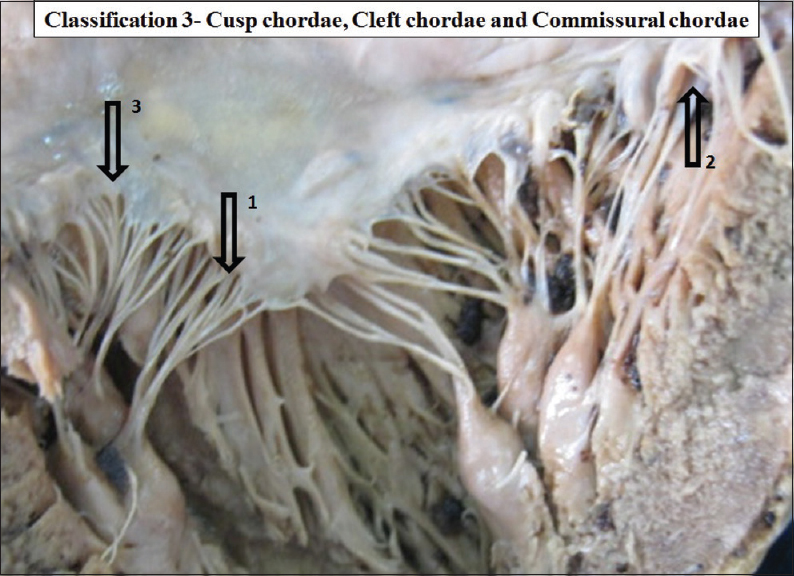 According to the attachments at the site of insertion, true chordae were further classified as the cusp chordae, commissural chordae and the cleft chordae [Figure 7] and [Figure 8]. Schematic diagrams of true chordae, cusp chordae and commissural chordae are shown in [Figure 9], [Figure 10], [Figure 11]. According to area of insertion and distribution of chordae on the parts of the cusps, chordae were further classified as the first order chordae and the second order chordae [Figure 12] and [Figure 13]. First order chordae are the chordae which are attached to the free margin of the cusps and therefore these are also called as the marginal chordae or free zone chordae. The second order chordae were attached to the ventricular surface of the cusp adjoining the free border forming the rough zone. These are also referred as the rough zone chordae. Mean number of the marginal chordae attached to a single cusp was 22.63 ranging from 11 to 35. Mean number of the second order chordae attached to a single cusp was 10.31 ranging from 6 to 15 [Table 2]. 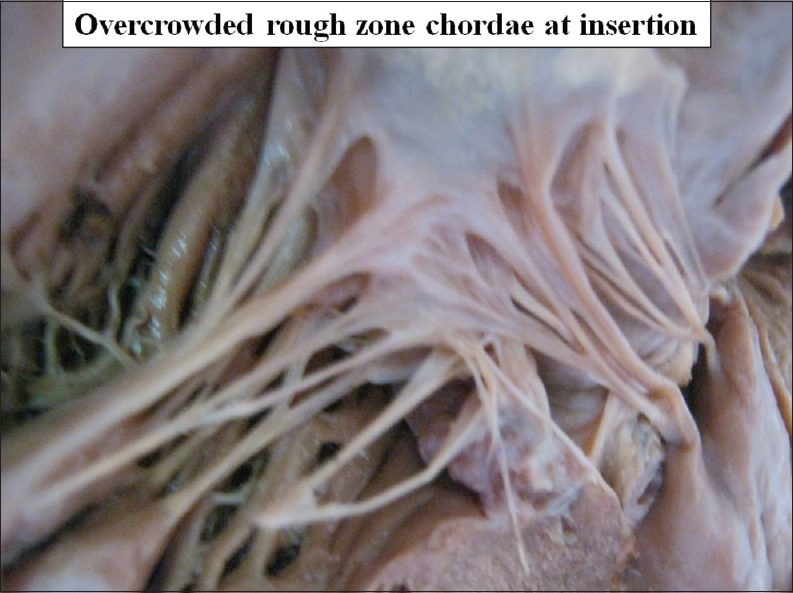 Number of chordae forming rough zone varies greatly so that rough zone looks overcrowded or loose [Figure 14] and [Figure 15]. 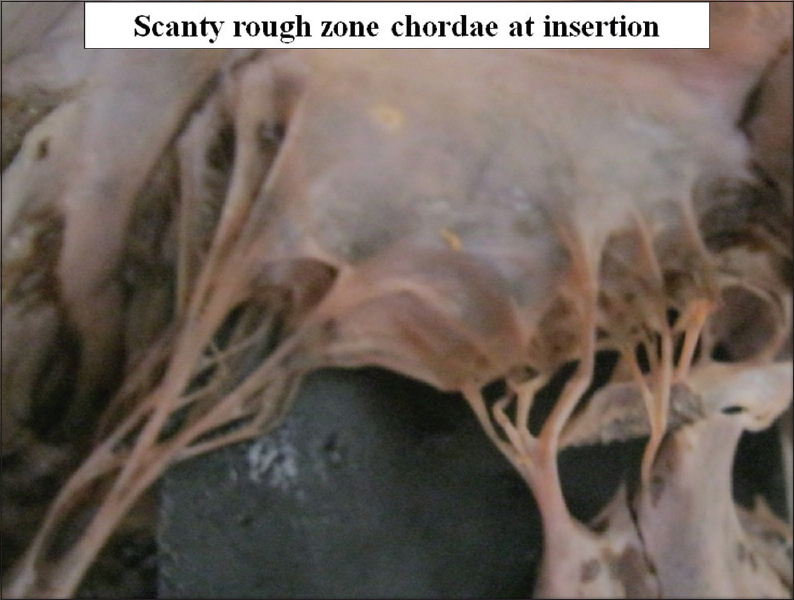 An interesting feature was found regarding the rough zone chordae. Among these chordae few chordae (2-4) are very much strong and tough, they are named as strut chordae. After examination of the insertion of the strut chordae in detail we found that these chordae are attached to the cusps with a broad aponeurosis in 45 cases (38.79%) [Figure 16]. In 16 cases (13.79%) transition of aponeurotic insertion into the broad thick muscular portion was also observed [Figure 17]. Muscular insertion was very prominent. Its appearance was like a double layered cusp [Figure 18]. 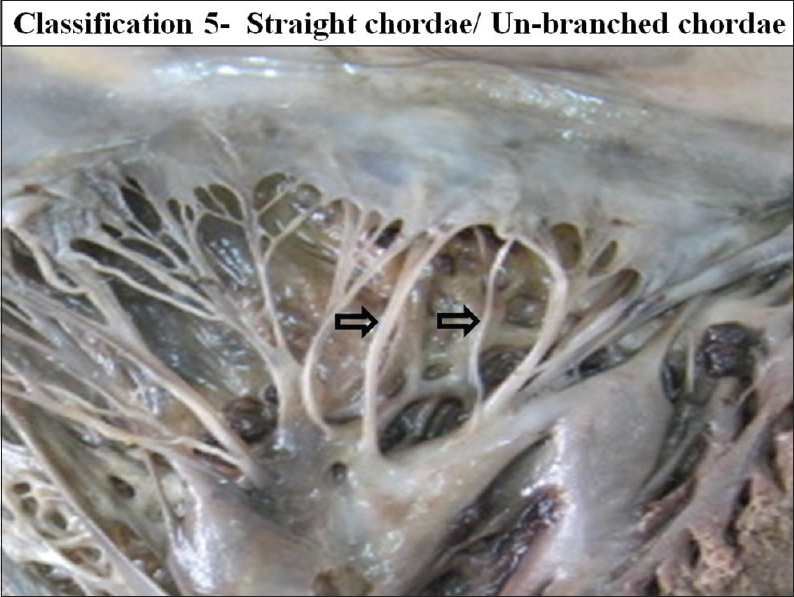 Chordae count at site of origin papillary muscle is much less as compare to the number of chordae at the site of insertion (cusps) due to the branching of the chordae. 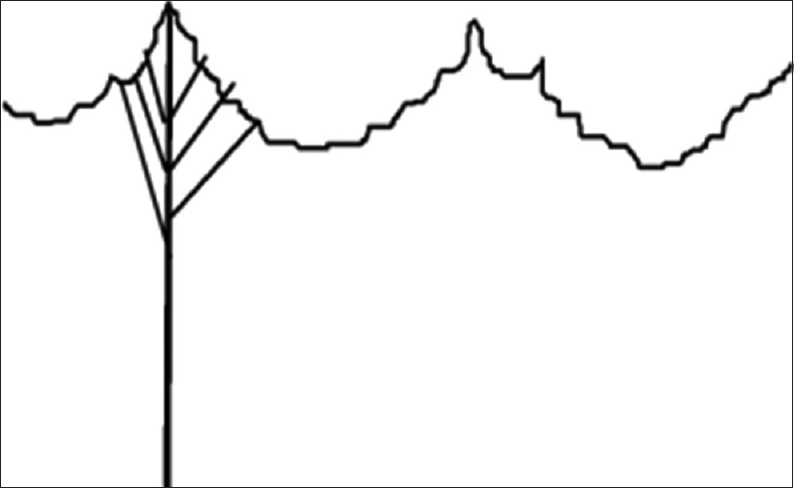 According to the branching pattern chordae were further classified from type 1 to type 4 [Figure 19], [Figure 20], [Figure 21], [Figure 22]. Schematic diagram of different types of branching is shown in [Figure 23]. Type 4 - Irregular/web forming. Out of all the types of branching pattern the most commonly found type was the branched/fan shaped chordae and spiral/dichotomous branching. Least commonly found chordae were the simple/unbranched and the irregular/web forming chordae. Type 2 branched fan shaped chordae was present in all mitral valves. It was mostly the cusp pillar chordae and these are mostly present in the commissural region of the cusps. Types 1 simple un-branched chordae were present in the 23 mitral valves (19.82%). Types 3 Spiral or Dichotomous branching was seen in the 40 mitral valves (34.48%). 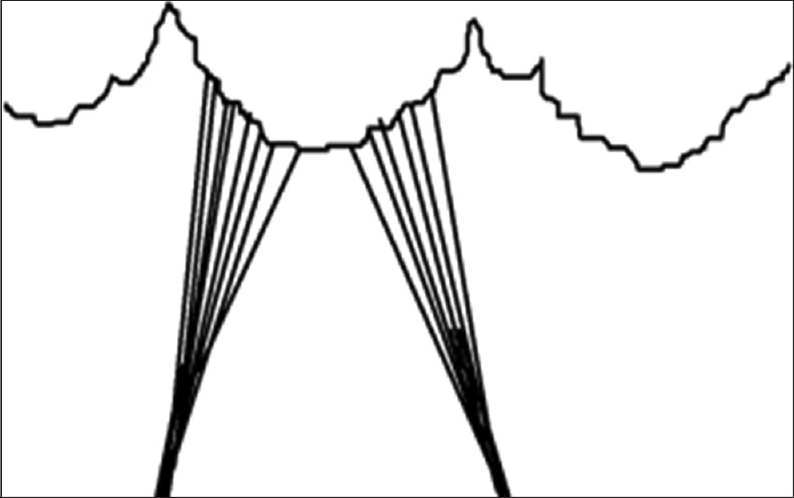 In few cases free marginal first order branched chordae were found to be in the form of a web, displaying an irregular pattern. This was the type 4 chordae, present in 18 cases (15.51%). 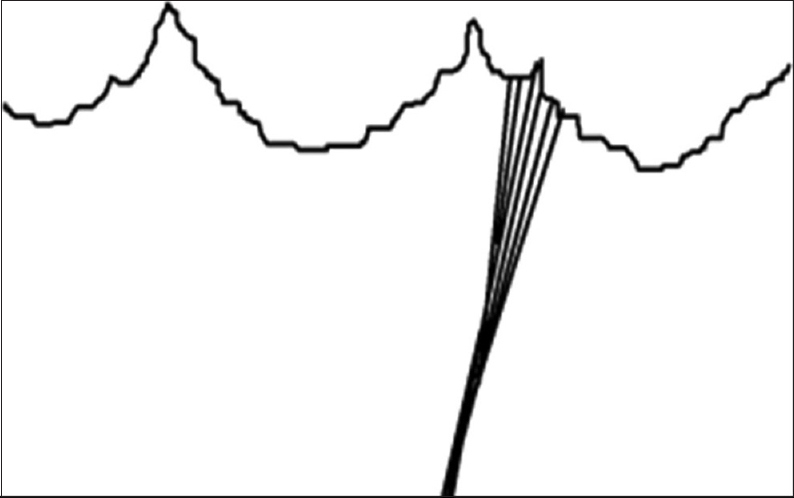 One chordae after origin runs toward the cusp. In its course after its one-third course it divides into number of branches usually 3-6. Out of the three branches one gets attached to the free margin of the cusp, second gets attachment to the ventricular surface of the cusp but near to the free margin and the third attaches to the ventricular surface near the clear zone. Numbers of CT according to the branching pattern were tabulated in [Table 3]. According to gross structure, CT were divided into three types: Tendinous chordae, muscular chordae and membranous chordae. 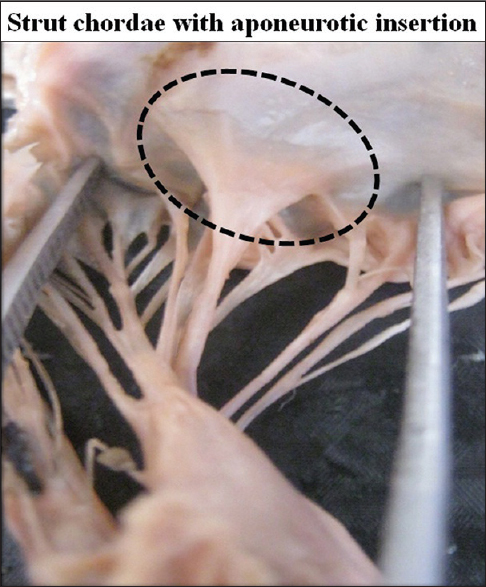 Tendinous chordae were found in all mitral valves (100%). 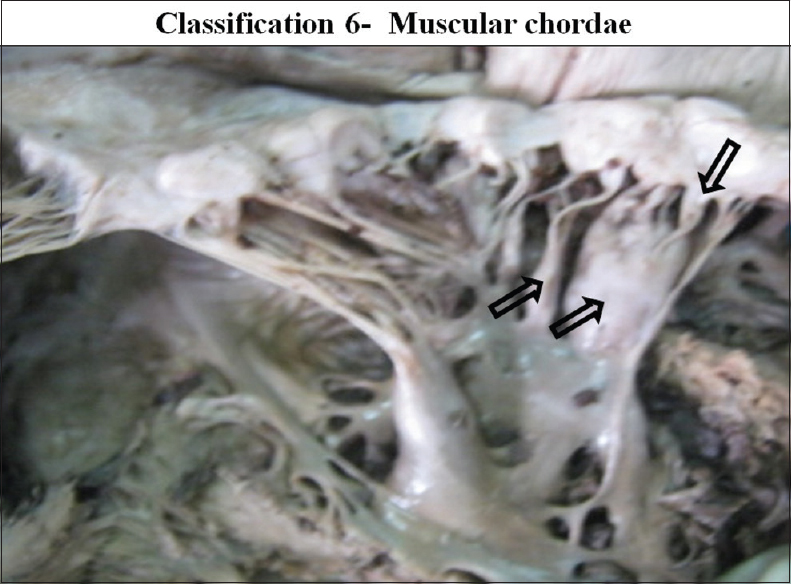 Chordae muscularis were found in 17 cases in 14.65% and membranous chordae were seen in seven cases 6.03% of the valve studied [Figure 24], [Figure 25], [Figure 26]. Chordae are the thick, strong, tendinous connections between the mitral valve cusps and the papillary muscles. Chordae not only form a component of the mitral valve complex but it also maintains the continuity between the mitral valve cusps and the papillary muscles. Thus, they maintain mitral valve function and cardiovascular physiology. Chordal elongation and chordae rupture affects the mitral valve function and cardiovascular physiology. A number of previous authors ,,,,,,, have studied the CT of the mitral valve. All authors followed a classification of chordae originally given by Tandler et al. and later by Quain. This classification suggests that the chordae are arranged in three orders. It oversimplifies chordal arrangement and morphology. It neither emphasizes the morphologic differences between chordae nor relates their sites of insertion to their function. This classification is based on a single feature of CT. In the present study we have classified the chordae by six different features of chordae. These are the origin, insertion, attachments, branching patterns, distribution and the gross texture of the CT. Though chordae are divided into six different ways, the classification is simple, elaborate and covers all points of chordae. Silver et al. studied the morphology of 50 normal tricuspid valves. Five types of chordae were distinguished by their morphology and mode of insertion: Fan-shaped, rough zone, basal, free edge, and deep chordae. The last two types are unique to the tricuspid valve. Author suggests that the fan-shaped chordae were of major importance in defining the commissures between the tricuspid leaflets and the clefts of its posterior leaflet. Present study follows this method of identification. 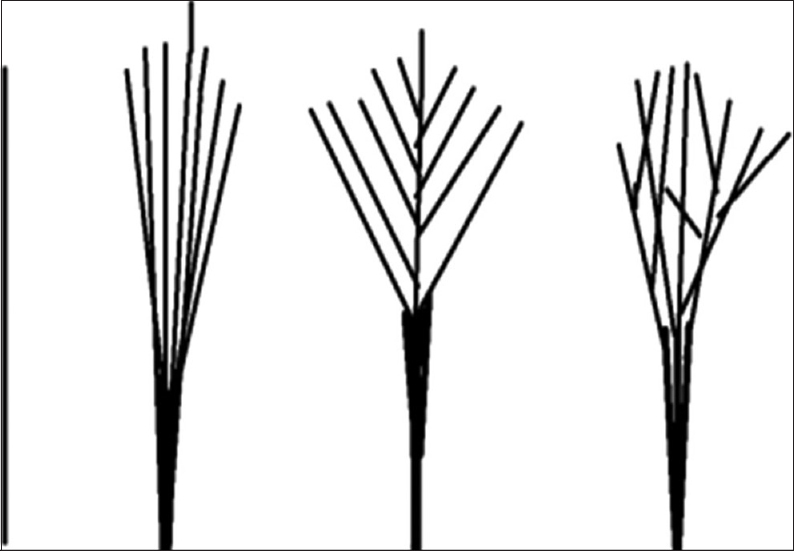 Four patterns of branching were found in the present study. The fan chordae arise as a single stem, but branch like the struts of a fan. These inserts at the commissures and clefts and helps in folding and unfolding during the closure and opening of the valve and so aid apposition of the leaflets in this area. This type of chordae allows the adjacent leaflets to coapt and to move apart. Lam et al. describe these as single cords that typically split into three cords soon after their origin from the papillary muscle. One cord inserts to the free margin of the leaflet, and the other two to the rough zone, reinforcing the zone of apposition. Leaflets and chordae develops by remodeling of cushions. 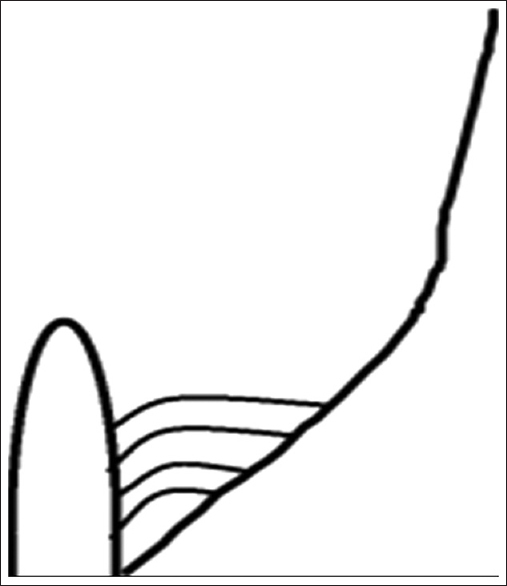 In this process only the chordal part of the cushion remains attached to the developing papillary muscles. Chordae muscularis are probably due to the developmental arrest. These chordae retained their embryonic muscular structures. In the present study chordae muscularis were seen in 14% specimens. Gray's Anatomy 39 th ed. (2005) stated that the false chordae occur in about 50% of all human left ventricles. False chordae were present in 56% cases in our study. We observed that the false chordae originated usually from the basal half of the papillary muscles. These false chordae are further divided into the interpillar chordae and the pillar-wall chordae. In the present study, in addition to the above types, the classification of CT was further extended by dividing them into first and second order chordae depending on place of chordal attachments on ventricular surface of the cusp; presence of branching; and structural appearance of CT. Strut chordae presented in two forms, either aponeurotic or muscular; they were like a second layer of a cusp, probably developed in response to need for a stronger valvular attachment that spreads over an area. Skwarek et al. found three types of connection, that represent the evolutionary line. These connections are type 1 - straight connection, type 2 - membranous connection and type 3 - tendinous connection. The first type was present in 30.27% and membranous connections were found in 6.54% of the group studied. Mitral valvular-ventricular continuity is important for LV systolic function, but the specific contributions of the AL second-order "strut" chordae are unknown. If annulo-papillary muscle continuity is to be restored with either polytetrafluoroethylene (PTFE) sutures or a mitral allograft in mitral valve replacement, preoperative or intraoperative determination of the distance between the tip of papillary muscle and the mitral annulus is crucial in each case, because of the anatomic variations of the papillary muscles such as position, number, shortening, or development. Proper positioning of the papillary muscle, alignment of its chordae and the direction of tractions exerted on the cusp are of prime importance, from the standpoint of normal cardiovascular physiology. Chord replacement with PTFE sutures is becoming increasingly popular because of its availability and proven durability. At a follow up of over 15 years, no case of suture rupture has been reported thus far. , Experimental and clinical studies have shown that after a few months, the chord becomes completely encased within a fibrous sheath and are impossible to differentiate from the other chords, and maintains its strength and flexibility. Carpentier  stated that "In the future broken chordae will be repaired as soon as diagnosis is made". Surgical repair is the gold standard therapy for mitral valve insufficiency today. Numerous techniques have been described. Proposed techniques are resection of the prolapsed segment, chordae transfer and ring annuloplasty. Lately, the implantation of neochordae and the loop-technique has been established and is the preferred technique in many centers. Modern repair techniques such as neo-chord implantation, with the loop-technique combined with minimally invasive access routes result in low mortality and morbidity. Chordae plays an important role in ventricular contraction by maintaining the continuity in between the different components of the mitral valve complex with proper tension. We have described more than 21 terminologies of the chordae in a simple manner with the help of classification according to six different ways. Limitation of the study is that the functional aspects are drawn only by assumption. However the advantage of this study is that the each and every aspect about the mitral valve chordae and its surroundings is observed clearly without any assumption or imagination as is done in the three dimensional models of radiograms and echocardiograms. In the present study, 21 terminologies of chordae were defined by classifying the CT into six different types. 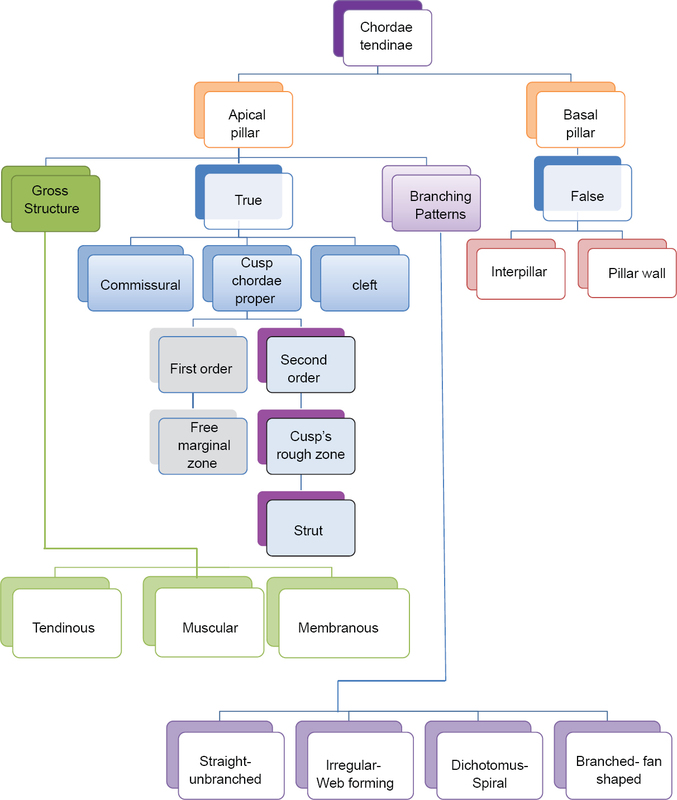 Classification is done according to the origin, attachments, insertion, distribution, branching pattern and gross structure. Terminologies defined are (1) Apical pillar chordae, (2) Basal Pillar chordae, (3) True chordae, (4) False chordae, (5) Interpillar chordae, (6) Pillar wall chordae, (7) Cusp chordae, (8) Cleft chordae, (9) Commissural chordae, (10) First order chordae, (11) Second order chordae, (12) Freezone chordae, (13) Marginal chordae, (14) Rough zone chordae, (15) Straight chordae (un-branched chordae), (16) Branched chordae (Fan shaped chordae), (17) Dichotomus, (Spiral chordae), (18) Irregular (Web forming chordae), (19) Tendnous, (20) Muscular chordae, (21) Membranous chordae. Typical ideal chordae are apical pillar, true chordae, cusp pillar, first or second ordered, branched fan shaped, tendinous chordae. Permutation and combination of different terminologies may present, forming multiple kinds of chordae. Multiple kinds of chordae along with multiple numbers of cusps and papillary muscles with different numbers, shapes, patterns and positions as in our previous studies may form infinite combinations of the mitral valves. Results of present study confirm our conclusion that no two mitral valve complexes have the same architectural arrangement, as each case seems to be unique. Chordae forms important component of the AV valve complex. It maintains the continuity of the valve complex. Mitral valve replacement with preservation of CT and papillary muscles may preserve postoperative left ventricular function better than conventional mitral valve replacement Mitral valve repair is preferred choice of surgeons instead of the replacement. 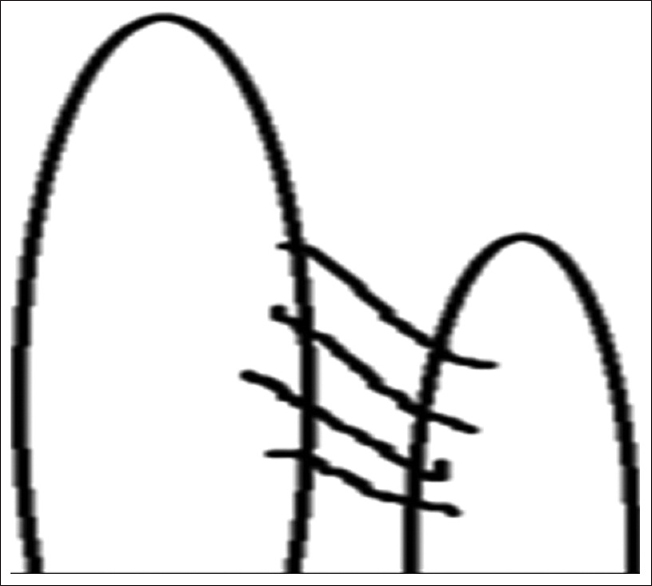 In those surgeries CS, chordal alignment, chordal sectioning are the different techniques used. In mitral valve replacement chordal grafting or neochordal-artificial chordae are implanted. In such surgical procedures anatomical knowledge is crucial. Our findings regarding the chordae explaining more than 21 different terminologies with six different ways, covering all the points of chordae could be helpful for cardiothoracic surgeons. Especially the findings regarding the branching pattern could be useful for implantation of artificial chordae. Gunnal SA, Farooqui MS, Wabale RN. Study of mitral valve in human cadaveric hearts. Heart Views 2012;13:132-5. Gunnal SA, Wabale RN, Farooqui MS. Morphological variations of papillary muscles in the mitral valve complex in human cadaveric hearts. Singapore Med J 2013;54:44-8. Sakai T, Okita Y, Ueda Y, Tahata T, Ogino H, Matsuyama K, et al. 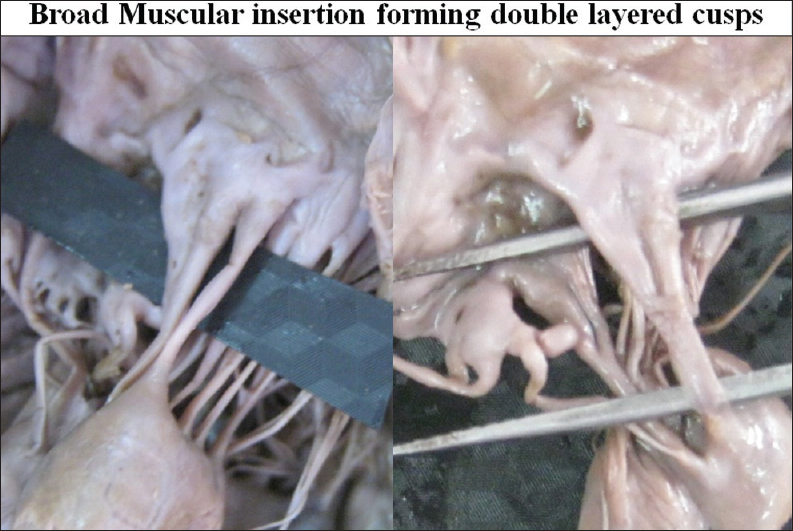 Distance between mitral anulus and papillary muscles: Anatomic study in normal human hearts. J Thorac Cardiovasc Surg 1999;118:636-41. Lam JH, Ranganathan N, Wigle ED, Silver MD. Morphology of the human mitral valve. 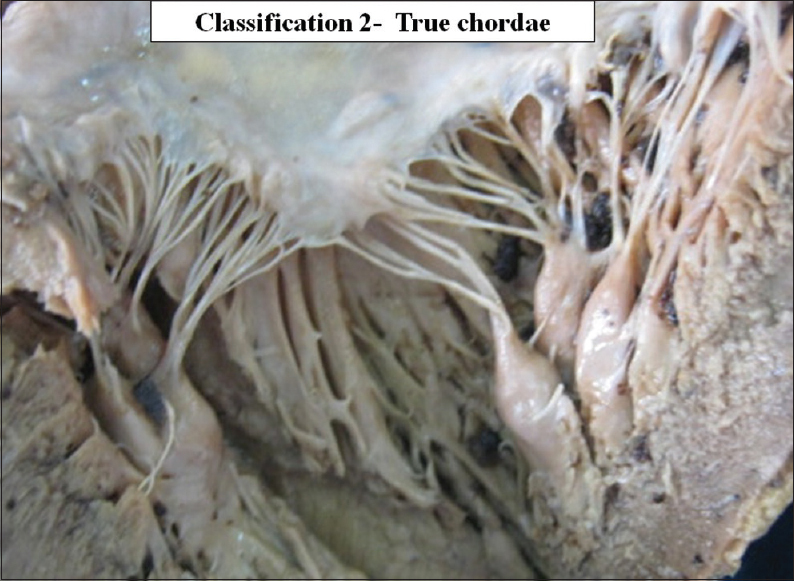 I. Chordae tendineae: A new classification. Circulation 1970;41:449-58. Sokoloff L, Elster SK, Righthand N. Sclerosis of the chordae tendineae of mitral valve. Circulation 1950;1:782. Rusted IE, Scheifley CH, Edwards JE. Studies of the mitral valve. I. Anatomic features of the normal mitral valve and associated structures. Circulation 1952;6:825-31. Rusted IE, Scheifley CH, Edwards JE, Kirklin JW. Guides to the commissures in operations upon the mitral valve. Proc Staff Meet Mayo Clin 1951;26:297-305. Brock RC. The surgical and pathological anatomy of the mitral valve. Br Heart J 1952;14:489-513. Chiechi MA, Lees WM, Thompson R. Functional anatomy of the normal mitral valve. J Thorac Surg 1956;32:378-98. Van der Spuy JC. The functional and clinical anatomy of the mitral valve. Br Heart J 1958;20:471-8. Frater RW, Ellis FH Jr. The anatomy of the canine mitral valve, with notes on function and comparisons with other mammalian mitral valves. J Surg Res 1961;1:171-8. Silverman ME, Hurst JW. The mitral complex. Am Heart J 1968;73:399. Tandler J, Abt I. Anatomy of Heart: Handbook of Anatomy of Man. Bandelben Gustav Fischer. Vol. 3. Jena: Verlagsbuchandlung; 1913. p. 84. Walmsley T, editor. Quain's Anatomy: The Heart, Part III. 2 nd ed., Vol. V. London: Longman, Green and Co.; 1929. p. 81. Silver MD, Lam JH, Ranganathan N, Wigle ED. Morphology of the human tricuspid valve. Circulation 1971;43:333-48. Oosthoek PW, Wenink AC, Wisse LJ, Gittenberger-de Groot AC. Development of the papillary muscles of the mitral valve: Morphogenetic background of parachute-like asymmetric mitral valves and other mitral valve anomalies. J Thorac Cardiovasc Surg 1998;116:36-46. Layman TE, Edwards JE. Anomalous mitral arcade. A type of congenital mitral insufficiency. Circulation 1967;35:389-95. Standring S. Gray's Anatomy. 39 th ed. Edinburgh: Elsevier Churchill Livingstone; 2005. p. 1006-8. McCarthy KP, Ring L, Rana BS. Anatomy of the mitral valve: Understanding the mitral valve complex in mitral regurgitation. Eur J Echocardiogr 2010;11:i3-9. He S, Weston MW, Lemmon J, Jensen M, Levine RA, Yoganathan AP. Geometric distribution of chordae tendineae: An important anatomic feature in mitral valve function. J Heart Valve Dis 2000;9:495-501. Skwarek M, Dudziak M, Hreczecha J, Grzybiak M. The connection between the papillary muscles and leaflets of the tricuspid valve. Folia Morphol (Warsz) 2006;65:322-8. Obadia JF, Casali C, Chassignolle JF, Janier M. Mitral subvalvular apparatus: Different functions of primary and secondary chordae. Circulation 1997;96:3124-8. Kunzelman KS, Cochran RP. Mechanical properties of basal and marginal mitral valve chordae tendineae. ASAIO Trans 1990;36:M405-8. Messas E, Guerrero JL, Handschumacher MD, Conrad C, Chow CM, Sullivan S, et al. Chordal cutting: A new therapeutic approach for ischemic mitral regurgitation. Circulation 2001;104:1958-63. Messas E, Pouzet B, Touchot B, Guerrero JL, Vlahakes GJ, Desnos M, et al. Efficacy of chordal cutting to relieve chronic persistent ischemic mitral regurgitation. Circulation 2003;108 Suppl 1:II111-5. Timek TA, Nielsen SL, Green GR, Dagum P, Bolger AF, Daughters GT, et al. Influence of anterior mitral leaflet second-order chordae on leaflet dynamics and valve competence. Ann Thorac Surg 2001;72:535-40. Nielsen SL, Timek TA, Green GR, Dagum P, Daughters GT, Hasenkam JM, et al. Influence of anterior mitral leaflet second-order chordae tendineae on left ventricular systolic function. Circulation 2003;108:486-91. Rodriguez F, Langer F, Harrington KB, Tibayan FA, Zasio MK, Cheng A, et al. Importance of mitral valve second-order chordae for left ventricular geometry, wall thickening mechanics, and global systolic function. Circulation 2004;110:II115-22. David TE. Mitral valve replacement with preservation of chordae tendinae: Rationale and technical considerations. Ann Thorac Surg 1986;41:680-2. Ranganathan N, Lam JH, Wigle ED, Silver MD. Morphology of the human mitral valve. II. The value leaflets. Circulation 1970;41:459-67. David TE, Ivanov J, Armstrong S, Christie D, Rakowski H. A comparison of outcomes of mitral valve repair for degenerative disease with posterior, anterior, and bileaflet prolapse. J Thorac Cardiovasc Surg 2005;130:1242-9. Carpentier A. Cardiac valve surgery - the "French correction". J Thorac Cardiovasc Surg 1983;86:323-37. Liel-Cohen N, Guerrero JL, Otsuji Y, Handschumacher MD, Rudski LG, Hunziker PR, et al. Design of a new surgical approach for ventricular remodeling to relieve ischemic mitral regurgitation: Insights from 3-dimensional echocardiography. Circulation 2000;101:2756-63. Hvass U, Tapia M, Baron F, Pouzet B, Shafy A. Papillary muscle sling: A new functional approach to mitral repair in patients with ischemic left ventricular dysfunction and functional mitral regurgitation. Ann Thorac Surg 2003;75:809-11. Goetz WA, Lansac E, Lim HS, Stevens SA, Weber PA, Duran CM. Kinking of the atrioventricular plane during the cardiac cycle. Asian Cardiovasc Thorac Ann 2006;14:394-8. Smerup M, Funder J, Nyboe C, Høyer C, Pedersen TF, Ribe L, et al. Strut chordal-sparing mitral valve replacement preserves long-term left ventricular shape and function in pigs. J Thorac Cardiovasc Surg 2005;130:1675-82. Talwar S, Jayanthkumar HV, Kumar AS. Chordal preservation during mitral valve replacement: Basis, techniques and results. Indian J Thorac Cardiovasc Surg 2005;21:45-52. Vetter HO, Burack JH, Factor SM, Macuso F, Frater RW. 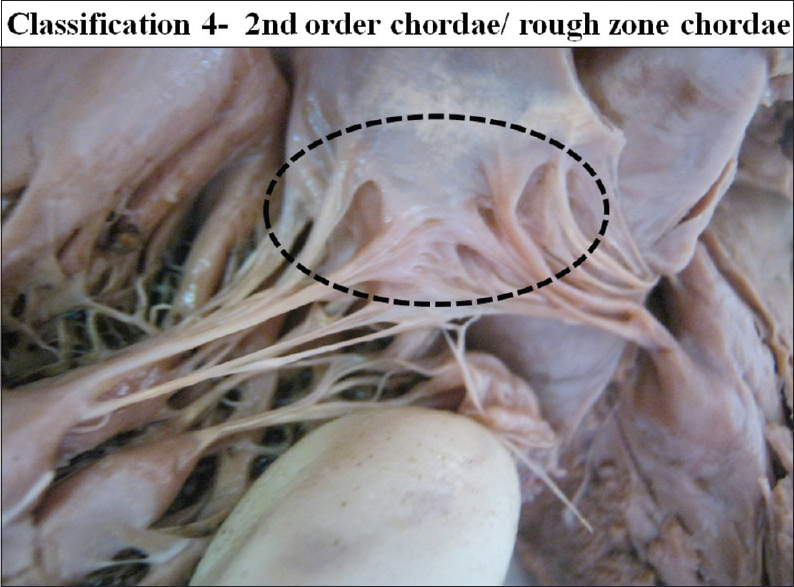 Replacement of chordae tendineae of the mitral valve using a new expanded PTFE suture in sheep. In: Bodnar E, Yacoub M, editors. Biologic and Bioprosthetic Valves. Yorke Medical Books. New York: Dun-Donnelley Publishing; 1986. p. 772-85. David TE, Omran A, Armstrong S, Sun Z, Ivanov J. Long-term results of mitral valve repair for myxomatous disease with and without chordal replacement with expanded polytetrafluoroethylene sutures. J Thorac Cardiovasc Surg 1998;115:1279-85. Gregori F Jr, da Silva SS, Goulart MP, Canesin O, Hayashi SS. 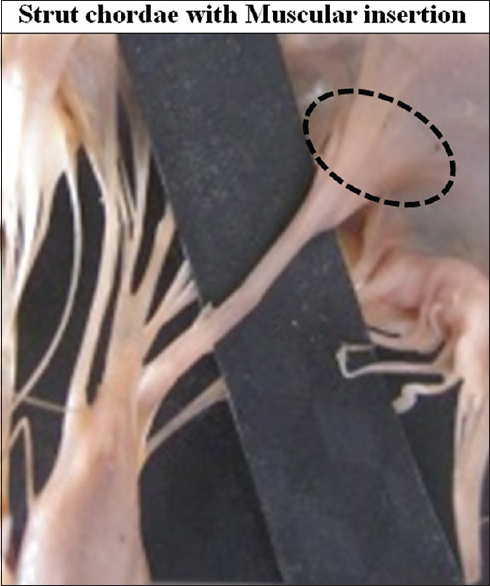 Grafting of chordae tendineae: A new technique for the repair of mitral insufficiency caused by ruptured chordae of the anterior leaflet. J Thorac Cardiovasc Surg 1994;107:635-8.